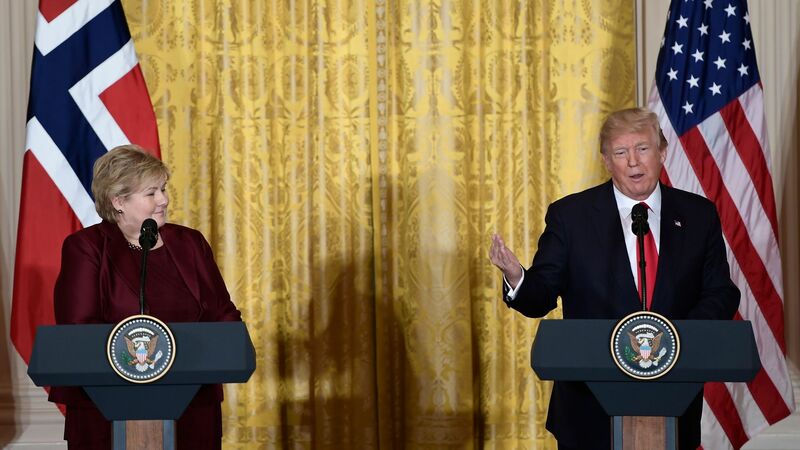 President Trump speaks during a news conference with Prime Minister of Norway Erna Solberg. Photo: Brendan Smialowski / AFP via Getty Images. President Trump said Wednesday that, “Any solution [regarding DACA] has to include the wall because without the wall it doesn’t work," in a joint press conference with Norwegian Prime Minister Erna Solberg. Trump also dodged questions on whether he'd sit down with Special Counsel Robert Mueller as part of the Russia probe. "We'll see what happens," he said. "When you have no collusion ... it seems unlikely that you'd even have an interview." One climate thing: Norway is one of the most progressive oil-producing countries when it comes to climate change, Axios' Amy Harder points out, and the contrast between Norway's prime minister and Trump at this press conference was really striking. Solberg reiterated her country's commitment to climate change and the Paris agreement. In response, Trump said he could conceivably see the U.S. re-entering the pact if a better deal for U.S. companies was worked out. Note: Technically, the U.S. is still part of the pact. It'll take until right after the next presidential election for the withdrawal process to be final. North Korea: “I think we'll see peace through strength … We have a lot of problems with North Korea, but we’re seeing a lot of good energy." Russia probe: "There is collusion, but it's really with the Democrats and the Russians ... The witch hunt continues." NATO: Trump thanked Solberg for meeting the 2% GDP requirement for NATO. Trade: "I want to thank the people of Norway for their commitment to fair and reciprocal trade. A word you're going to hear more and more from this administration ... Remember the word reciprocal." Anti-terrorism efforts: "Norway has made contributions to the NATO-led mission in Afghanistan" and "Norway is also a key ally in campaign to defeat ISIS ... We are grateful." The U.S. is Norway's "closest ally, trade partner and friend." On the Russia probe: "I think that it's up to every political system in countries to scrutinize and discuss the political agenda in their countries ... This is an issue for American politics."